Black mold infestation, along with the other types of mold, is simply devastating. It’s ugly, odorous, and risky to one’s health and safety. The worst part is that it grows and germinates easily. All it requires are moist or humid and organic food. It comes in different shapes and hues, like blue, black, white, green, or a combination of these colors. It affects areas that are often damp and moist, such as the basement, ceiling tiles, bathroom tiles, damped wood, shower heads, bathtubs, and a lot more. However, what makes mold growth alarming is not only the unpleasant sight it brings to one’s home but the medical problems it may cause. The toxic it produces can get airborne and it spreads easily all over the area, making their way into the people and pets living nearby. Some of the mold-related conditions include asthma, skin irritation, respiratory problems, and worse – death. One of the common solutions to address this concern is through the use of household chlorine bleach. But does bleach really kill black mold? Does Bleach Really Work In Killing Molds? Bleach is one of the most popular disinfecting and sanitizing chemical used in homes and other establishments. As a potent oxidizer, it is known as an effective solution to get rid of certain types of bacteria. While it is true that it helps in killing molds on certain areas, such as countertops, bathroom tiles, bathtubs, and glass-surfaces, it cannot penetrate underneath areas that are infected with molds. According to the experts, this harsh, corrosive chemical can only work on non-porous surfaces – not on layers that are porous – such as wood or drywall. Basically, molds do not just grow on the areas above but also underneath, which, sadly, bleach cannot penetrate. As the bleach stays on the surface, it makes the problem worse because the water only gets absorbed deeper. Although the mold is eliminated from the surface, it comes back in just a few days because the root is still implanted beneath. 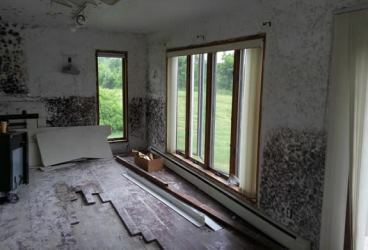 Using bleach to kill black mold is deemed effective as it gets rid of the mold and its moldy color; however, it doesn’t mean that it has been completely removed the mold for good. That being said, is it still recommended to use bleach when mitigating this fungus? If you’re aiming to remove mold in non-porous surfaces, bleach is still a feasible option. However, since it is a harsh chemical, the Environmental Protection Agency (EPA) says otherwise as it is risky to one’s health and property. First, it is a corrosive chemical which damages the surface where it is applied. The fumes produced are also harmful to the lungs and esophagus lining; thus it’s recommended to wear a face mask when using it. It can cause irritation to the skin and eyes so it’s best to use gloves and eye goggles. When not attended immediately, bleach can cause further damage to your eye tissues. It’s also worth considering using bleach only as an option, not a first choice since it is harmful to the environment. It emits a foul, strong odor and should not be used with ammonia as it produces a very toxic gas. For safer alternatives, you can use baking soda, vinegar, or tea tree oil when removing black mold. Otherwise, you can call a mold removal expert for professional assistance.